The Snom 710 desktop phone - a standout in its class with superior voice quality, rich features and user-friendly design all delivered at an affordable price. Part of Snom's 7xx series phone portfolio, the Snom 710 joins the Snom 720 and Snom 760 to form a state-of-the-art line of full-featured IP desktop phones for small or large scale deployments in a multitude of business scenarios. 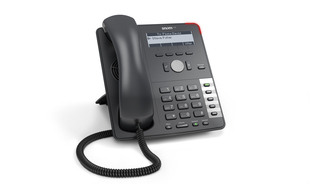 Supporting four SIP identities and blending an elegant utilitarian design for high usability with high performance and affordability, the Snom 710 delivers a rich set of everyday business telephony features critical to today's real-time, information-driven business workforce. Blending rich features and assured performance with usability and affordability, the Snom 710 is the right choice for organisations with large business needs but a small business budget. The Snom 710 has five programmable keys with built-in LEDs for visual call indication alerts. 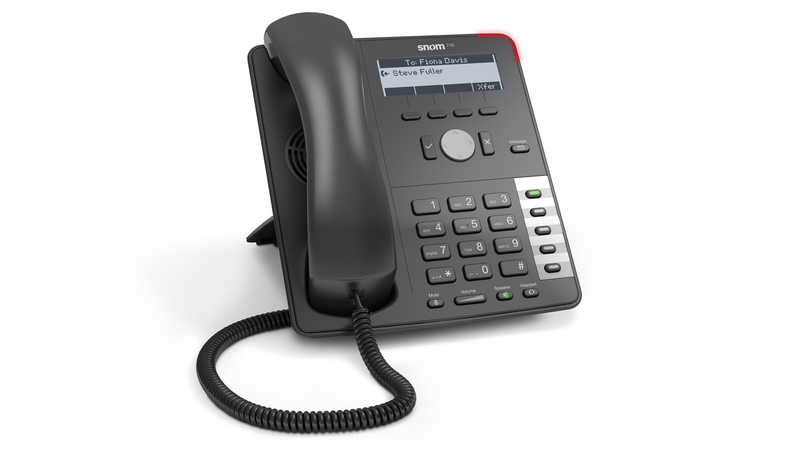 Each key is easily configured for a variety of one-touch telephony functions such as speed dial, busy lamp field or multiple extension handling.